Seeking new ways to interact with materials, products and people has become an obsession between design and technology. We have seen the wonders that designers and programmers have done with Kinect and the ever growing set of innovations through our mobile devices. Although gestures continue to show the promise of the future, designers and programmers must find inventive ways to combine elements that bring out unique experiences and interactions beyond the screen. Noisy Jelly is a fully working prototype produced in collaboration with Arduino and Max/Msp by Raphaël Pluvinage and Marianne Cauvard at L'Ensci Les Ateliers during a semester course. 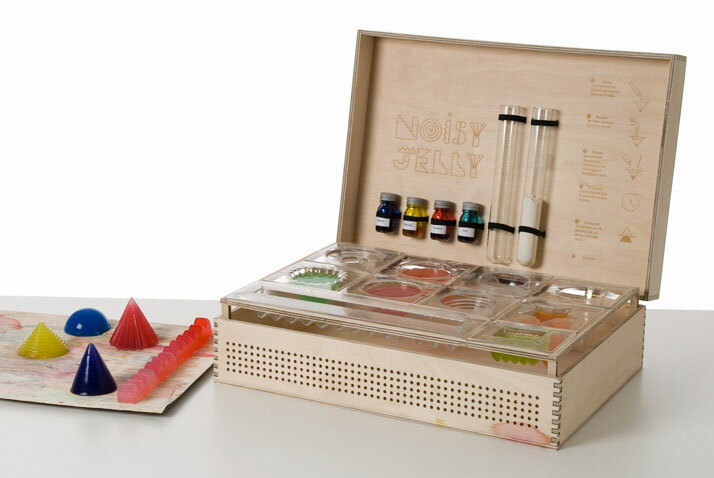 Noisy Jelly is a chemistry set where jelly can be shaped using mere water and a few grams of agar powder. Using a different shaped plastic molds, users then add color dye into the mix, pour it into the mold and leave to solidify for 10 minutes. Once the jelly is solidifies, the user can then place the finished shape on the game board and by touching the shape, the user activates different sounds. The audio signal is affected by distance, strength of touch and contact. Each malleable material demonstrates how electronics can now have a new aesthetic shape, texture and value. The game board is powered like a capacitive sensor; a technology based on capacitive coupling whereby human interaction is used as its input. Electrical engineers and designers continue to explore ways to use this technology as a human interface device (HID) technology in order to replace archaic shapes and move into more natural experiences. 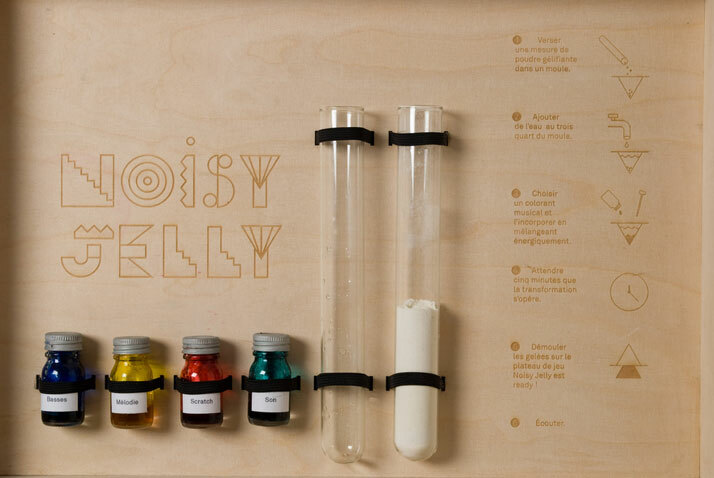 Noisy Jelly is a neat little project that exemplifies how technology and design can marry to flourish interesting notions of human behavior and future experiences. Capacitive technology itself is not entirely foreign to us as we are familiar with it through the use of devices such as track pads, mobile phones and tablets for example. 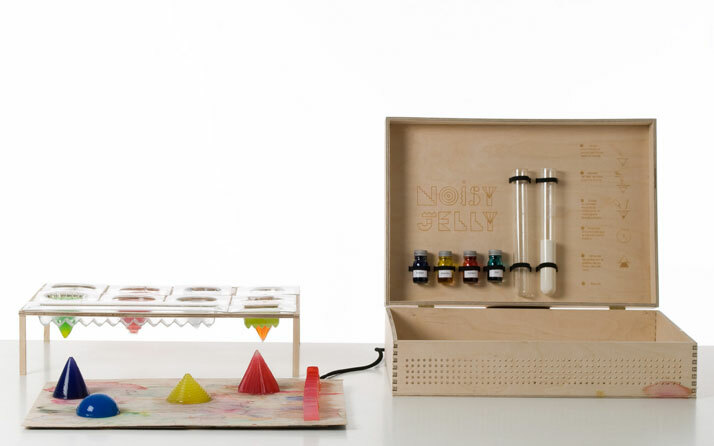 Noisy Jelly puts an interesting spin on a self made performance or entertainment product. 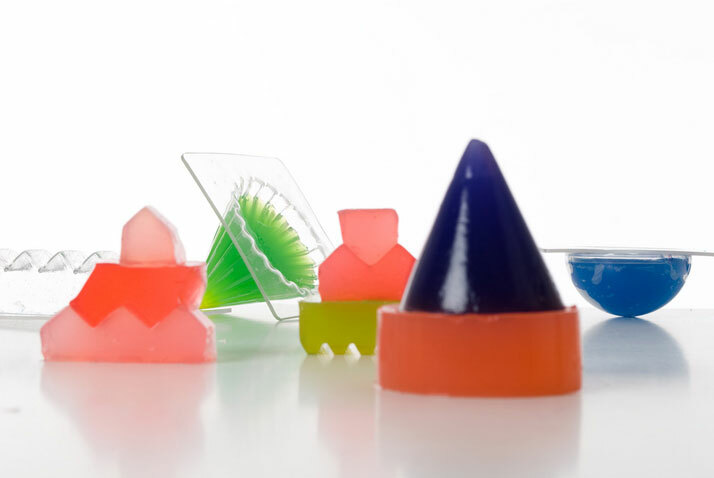 Although the set provides you with enough ingredients to shape a series of small jelly shapes, the potential to repeat this process in different shapes and sizes, creates the opportunity to shape environments that play sounds and are activated through human touch. Beyond fun and plain entertainment, we can see this technology being used to help the blind, as an education tool as well as many other applications where it seems to provide a disruptive behavior and positive change. Enjoy the project and imagine its possibilities. The future is exciting and we are thrilled to be part of game changing projects like Noisy Jelly.